The Film: Grab your hankies for the sentimental weepie, Goodbye, Mr. Chips. 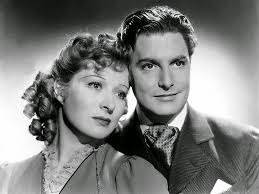 The Stars: Robert Donat and Greer Garson. Source Material: The 1934 novel, "Goodbye, Mr. Chips" By James Hilton. 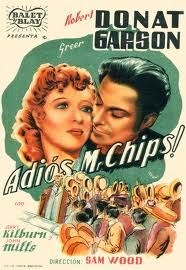 A Spanish poster for Goodbye, Mr. Chips. Awards: One Academy Award: Best Actor for Robert Donat. 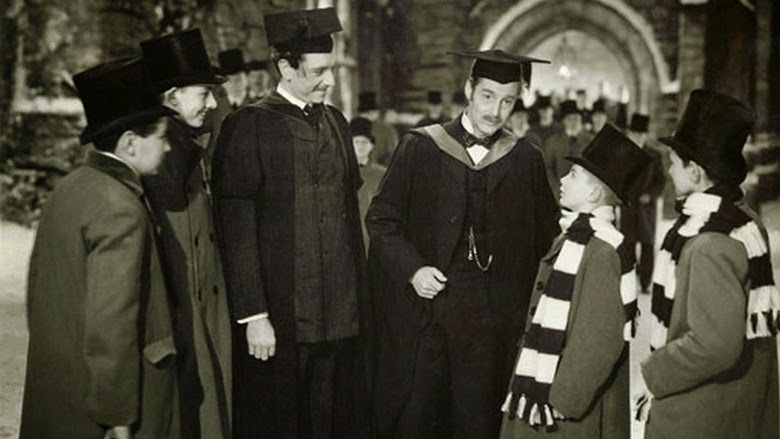 The Plot: Goodbye, Mr. Chips tells the life story of Charles Chipping, who teaches Latin at Brookfield, an English public school, for more than 60 years. Location: Goodbye, Mr. Chips was filmed at MGM's English studios in Denham Buckinghamshire. 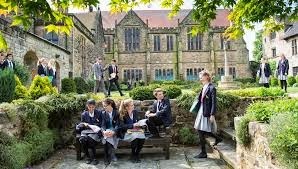 The cast and crew also traveled to Repton School in Derbyshire for location shooting. Many students and teachers worked on the film, with about 200 Repton schoolboys appearing as extras in the film. Repton School today. As you can see, they now admit girls. Best Performance: Robert Donat as Mr. Chips. Donat appeared in English films throughout the 1930s, most famously starring in Alfred Hitchcock's The 39 Steps (1935). His lead role in The Citadel (1938), which was a massive hit for MGM, earned him the part of Mr. Chips. Donat never hits a false note in an extremely tricky part that requires him to age from his 20s to his 80s. He was a surprise Oscar winner -- many people thought either Clark Gable in Gone With the Wind or James Stewart in Mr. Smith Goes to Washington would win -- but he certainly deserved the honor. Greer Garson and Robert Donat in a publicity still for Goodbye, Mr. Chips (1939). Breakthrough Performance: Greer Garson as Mr. Chips wife, Kathy. 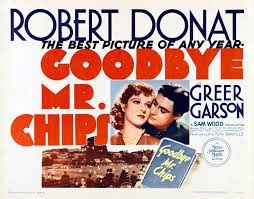 Garson was a little-known Irish actress when director Sam Wood saw her screen test and chose her for the role of a feisty and beautiful young woman who wins the heart of the middle-aged Mr. Chips. The role catapulted Garson to stardom: She would become the queen of MGM three years later when she won an Oscar for playing wartime British housewife, Mrs. Miniver. Best Line: "I thought I heard you saying it was a pity, a pity that I never had any children, but you're wrong. I have thousands of them. Thousands of them and they're all boys." Mr. Chips, overhearing a conversation on his deathbed. 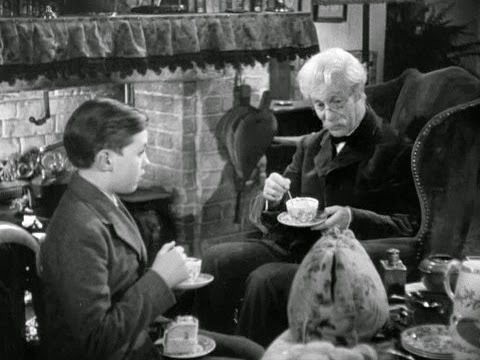 Mr. Chips shares tea with a young pupil (Terry Kilburn) in Goodbye, Mr. Chips (1939). The Show-stopper: The final scene where generations of Brookfield students doff their caps and salute Mr. Chips. Fun Fact: Composer Richard Addinsell wrote an official school song for Brookfield as part of his score for Goodbye, Mr. Chips. It can be heard in the opening shots in this clip. Why it's essential: Goodbye, Mr. Chips is one of the best MGM films of the studio-system era. Yes, it's a sentimental tearjerker, but those tears are earned through Wood's exceptional direction and through the fine performances of Donat, Garson and the rest of the cast. Goodbye, Mr. Chips has influenced the many films about teachers that have followed, including Dead Poet's Society and Mr. Holland's Opus. Next week James Cagney and George Raft do hard time in Each Dawn I Die.